U.S. 50 shares substantial portions of its alignment across the Beehive State with other numbered highways. This includes an 89.40 mile overlap with U.S. 6 from the Ferguson Desert and Nevada state line to Sevier Valley and the city of Delta, a 10.09 mile concurrency with Interstate 15 from Holden to Scipio, a 1.765 mile overlap with U.S. 89 through Salina, and 174.94 miles with I-70 to the Colorado state line. The first independent section of U.S. 50 angle southeast across the Pahvant Valley between Delta and Holden. Branching south from I-15, the second portion runs between the Pahvant Range and Valley Mountains to Scipio Lake and the Sevier County line. Turning east across the Valley Mountains, U.S. 50 reaches Salina where it combine with U.S. 89 south to Interstate 70. This sign used to precede the split of U.S. 6 and 50 east in Downtown Delta. 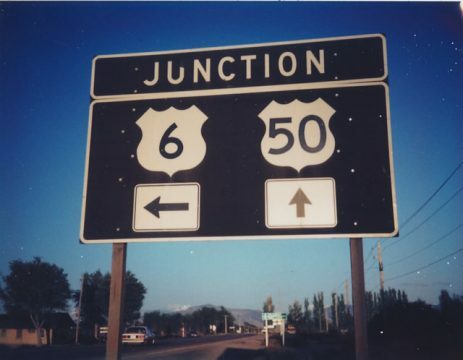 U.S. 6 aims northeast toward Payson, Spanish Fork, and Provo while U.S. 50 diverges southward toward Holden and Scipio. Photo taken by Michael Summa (1979). This U.S. 50 east reassurance route marker posted after the split from Interstate 15 in Scipio. U.S. 50 follows 400 North three blocks to State Street through the Scipio business district. Photo taken 04/30/11. Lowering from the Valley Mountains along side Denmark Wash, U.S. 50 approaches the north end of SR 260. SR 260 provides a cutoff south to SR 24 (old U.S. 89) and the city of Aurora. Photo taken 04/30/11. SR 260 stems south 4.18 miles from U.S. 50 to SR 24, 2.7 miles north of its connection with Interstate 70 west to Richfield and U.S. 89 south to Kanab. Photo taken 04/30/11. U.S. 60 travels north through the Scipio Valley to the town of Scipio and a western turn to Interstate 15. I-15 enters Scipio south from Nephi and Santaquin through Juab Valley. Photo taken 07/07/11. 400 North leads U.S. 50 west from State Street to a diamond interchange (Exit 188) with Interstate 15. The two combine for 12 miles southwest across Scipio Pass to Holden. Photo taken 07/07/11. 04/30/11 by Karl Forth. 07/07/11 by Garrett Smith.